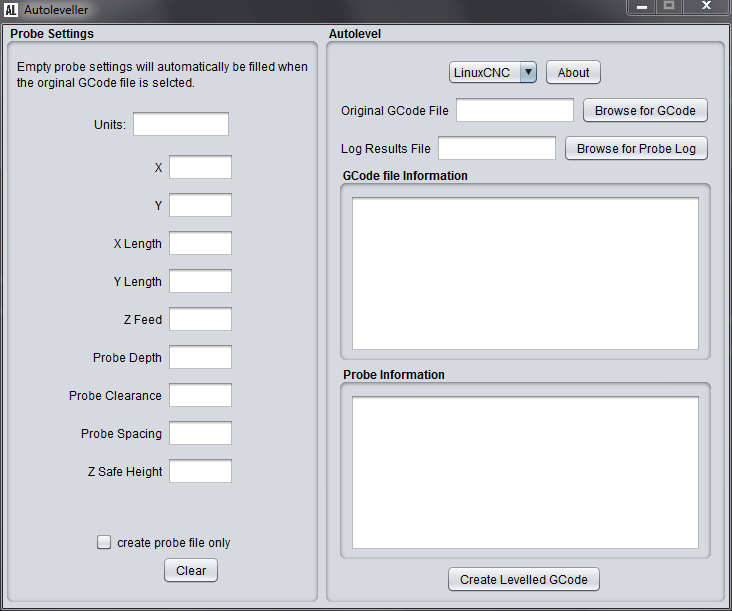 In this context, an autoleveler is a bit of softeare that reads your G-Code file – the one output by PCB-GCode – and adds a bit of clever math to it. To prepare “autoleveled” G-code is quite easy, just open the autoleveler, point it to the G-Code of interest, and hit “go”. Out the other end comes your G-Code with the autoleveler magic included. You can see a probe in the background that is connected to the “probe in” port of my milling system. This is a mandatory part of the probing process. This probe is a sewing pin rigged through some plastic pipe in which is a bolt for some weight to ensure good contact to the PCB. When probing is done, the modified G-Code uses the information from this ‘topographical map’ to make fine adjustments in your Z axis ‘on the fly’. Here is a video of my Z-axis during milling of a trace. You can see there is quite a bit of ‘fine tuning’ that is happening. Probing Z axis adjust. Before probing, double check that the wiring to your tool and to the probe-in of you milling machine is complete and functional. Otherwise you could damage the tool and/or PCB. I have tried at least 4 or 5 different versions, and some work, some don’t. The one I settled on is easy to use, flexible and it works. Based on my experience I can recommend it. I have even used it on G-Code generated from CAM-BAM for engraving brass plaques, and it worked great. The software is from www.autoleveller.co.uk/. Older versions of the software are no charge. Pay the man the 20 pounds for all his hard work and you get access to the latest versions (which I recommend). The interface is very simple, easy to use and the results are spot-on. Consult the website for more information. To avoid punching holes in your PCB, you need to wire-up and configure the “Probe In” line using the StepConfig Wizard (EMC). I already had all my inputs brought to an opto isolation board so wiring up and configuring this line took only a few minutes. For my installation, I needed to check the “invert signal” checkbox for the Probe In line. For the actual probe, I use the same bit I will be using to mill. I do not move the bit at all between probing and milling, I just disconnect the wire and turn on the spindle. Lesson 3: Calibrate your setup. The copper on a 1oz PCB is 35 µm or about 1.4 mils (.0014″) thick. That isn’t much if the surface of the PCB is ‘waving around’ by 3-4 thousandths or more! I recommend playing around with this calibration board and ‘futzing’ with your settings until you have the best results possible.